The difference in investment return rates is sometimes called a 'spread' and the historical spread between government debt and mortgage debt is somewhere near 1.5 percent. However, notice how the spread started to grow starting in July 2007. July 2007 marked the 'official' start of the Credit Crunch and as mortgage delinquencies grew nationwide, so did the market's perceived risk of investing in them. By the start of this month, the spread had nearly doubled. But that all changed Sunday. 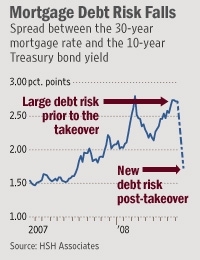 When the government announced its takeover of Fannie Mae and Freddie Mac, it put the same 'risk-free guarantee' on mortgage debt that has helped keep U.S. government debt so cheap to finance and the spread immediately shrunk. This is one reason why mortgage rates fell Monday and why they should continue to stay low over the near-term. With the U.S. government backing the mortgage market, there's no room for the risk premium that helped keep rates high this past year. It doesn't mean more people will qualify for conforming home loans, but for the ones that do, financing should be cheaper. Texas property taxes also include school taxes set by the school district. These vary widely. It is a shock to people not use to seeing such high property taxes.